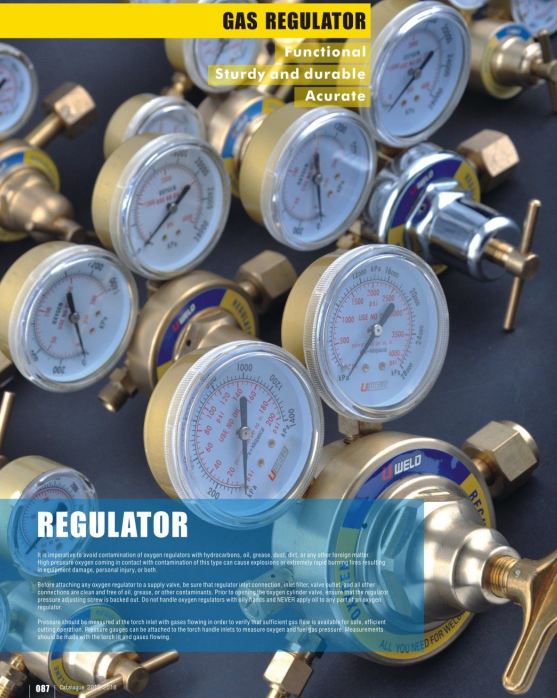 Product categories of Gas Regulator, we are specialized manufacturers from China, Gas Regulator, Gas Pressure Regulator suppliers/factory, wholesale high-quality products of Pressure Regulator R & D and manufacturing, we have the perfect after-sales service and technical support. Look forward to your cooperation! A Gas Regulator is an instrument used to control the flow of protective gas into the weld area. The gas stored in the cylinder is reduced by pressure reducer from inlet to out let, to achieve the required working pressure. Cylinder gas pressure will be decreased gradually with gas consumption, while the gas welding and gas cutting work require a relatively stable gas pressure. The gas regulator is capable of ensuring stable output gas working pressure, and the working pressure outside the low-pressure chamber can not be changed with the change of the pressure of the high-pressure gas in the cylinder. Especially designed for standard readily available disposable oxygen cylinders. Supplied with low pressure gauge, enabling control of the flow rate. Captive control knob prevents loss and tampering. Connection of other thread sizes available. Features large scale gauges for 2-1/2" for easy readability. Equipped with an internal relife valve that prevents tampering wiith the regulator which could result in a serious accident. One-piece encapsulated seat design with an internal filter prevents contamination.